As part of Five Rivers’ 10th Anniversary celebrations, we’ve been showcasing the authors we’ve been pleased to publish, how that association came to be, the books and novels they’ve written, the adventure. I remember reading a Dave Duncan fantasy back in the 1980s, long before Five Rivers was even a thought. 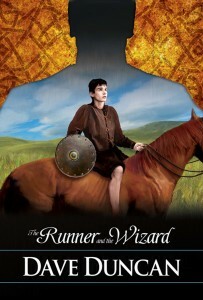 Duncan’s novel was an irreverent tale about a sorcerer’s apprentice, told with wit and cutting humour. Fast forward to 2013. Five Rivers publishes it’s first novel by Dave Duncan, which by then was about his 40th, the result of an association between Dave and former senior editor for Five Rivers, Robert Runté. It is strange indeed the recurring themes and paths that occur in life’s journey. The Runner and the Wizard, which was that first novel, began a bright journey with the legendary writer of fantasy and science fiction. That novella resulted in two more in The Adventures of Ivor series: The Runner and the Saint, and The Runner and the Kelpie, which then resulted in an omnibus: The Adventures of Ivor. By now, this transplanted Scotsman has penned over 60 novels, is both a founding and an honorary lifetime member of SF Canada, and an inductee of the Canadian Science Fiction and Fantasy Hall of Fame. His books have been translated into 15 languages. Dave and his wife Janet, his in-house editor and partner for fifty-nine years (so far,), live in Victoria, British Columbia. They have three children and four grandchildren. 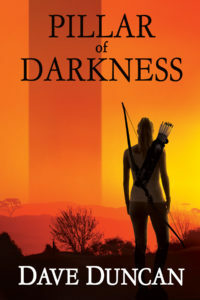 In February 2019, Five Rivers releases another science fiction by Dave Duncan, Pillar of Darkness, in both trade paperback and eBook. Two hundred miles wide and higher than the moon, Sungoback has stood over central Africa for thirty years, a pillar of light by night and of darkness by day. Science cannot explain it; it destroys technology. What secret lies at its centre: aliens, eternal life, distant past, or far future? Most who venture inside Sungoback are never seen again. Why would anybody dare? They all have their reasons. Pillar of Darkness tells of a party of nine very dissimilar people, who venture into Sungoback together, bound by their motives, their sufferings, and—eventually—their fates. And then in 2020 we’re pleased to present another installment in The King’s Blades series, The Ethical Swordsman. Dave says this is likely his last, given his venerable age. Somehow I have to wonder about that. Here is a persistent storyteller, one who dreams by day and sends out to the world those yarns he’s spun about imaginary people and places he’s conjured during his waking dreams. I do hope this won’t go to my head, because if it does I won’t be perfect any more.